The surgery was the fifth such surgery successfully performed across the world. The surgery was performed by applying Deep Hypothermic Circulatory Arrest (DHCA), a surgical technique that involves reduction of body temperature to 15°C. · The boy was in a very critical stage as 95 per cent of the blood circulation was blocked by the tumor, which had affected the right two chambers of heart. Kochi: In a rare surgery, heart surgeons at VPS Lakeshore successfully removed primary intracardiac yolk sac germ cell tumor developed in the heart of a two-year-old boy, Aadhi Thoppil Fabeer, who lives with his parents in Dubai. It was the fifth such surgery successfully performed across the world, claimed the hospital management. The surgery was performed by a 30-member medical team under Dr. M. K. Moosa Kunhi, Chief Surgeon and HoD, Cardiac Surgery and Heart Transplantation, VPS Lakeshore. “It’s a rarest of rare case. The yolk sac tissue, which develops on the third day of pregnancy, is usually dissolved within one month. But in this case, the tissue developed into a cancerous tumor. However, it was detected only when the parents took the boy to a hospital in Dubai recently after he was infected with fever. They brought him to VPS Lakeshore as the hospital in Dubai didn’t facility and experts to perform such a complicated surgery,” said Dr. M. K. Moosa Kunhi. He added that the boy was in a very critical stage as 95 per cent of the blood circulation was blocked by the tumor, which had affected the right two chambers of heart. “The tumor had to be removed at the earliest. The tumor, which had developed both inside and outside the heart, was removed after a nine-hour-long surgery. The surgery was performed by applying Deep Hypothermic Circulatory Arrest (DHCA), a surgical technique that involves reduction of body temperature to 15°C. It was a narrow escape from death for the boy as the surgery had only a 50:50 success rate”, said Dr. M. K. Moosa Kunhi. He further said that the boy’s health condition improved very well and he will be discharged within a few days. The boy’s parents said that they were in an extreme shock after doctors at a hospital in Dubai detected cancerous tumor in his heart. “Though the doctors at that hospital denied us permission to travel, we took the risk and came here as we were not confident of the experts and facilities there. On the next day itself we travelled to Kochi and Aadhi was taken in an ambulance from Nedumbassery airport to the hospital. We are extremely thankful to the hospital authorities, especially Dr. Moosa Kunhi, as he readily agreed to perform the surgery on the Eid day without a second thought,” said a highly relieved Jeny Merin Fabeer, mother of the kid. She added that the boy is in a very good condition now. The hospital authorities said that the boy have to undergo chemotherapy in the future to check any growth of the tumor. 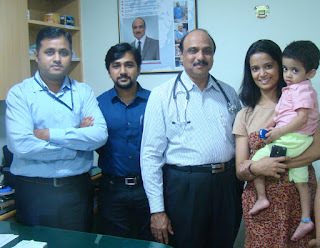 Dr Moosa Kunhi was assisted in the surgery by Dr. Sachin and Dr. Jagadeesh.